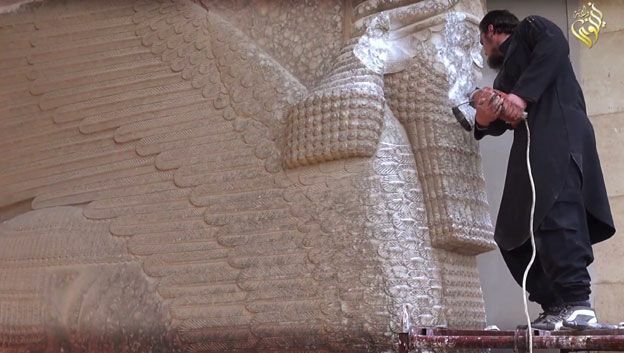 One year ago a man took a pneumatic drill to the statue of a winged bull at the gates of the ancient city of Nineveh, near Mosul in modern Iraq. It's one of countless treasures destroyed by vandals, militants or military action in the region in the past 15 years. This is the first of 10 stories about ancient objects that have now been lost. The winged bull had the head of a man, the wings of an eagle, and the hulking body of a bull. Known as a Lamassu, other examples had the body of a lion. It was a composite of the most powerful and ferocious creatures known in the region, and this particular sculpture was huge - about 4.5m high, and up to 30 tonnes in weight. 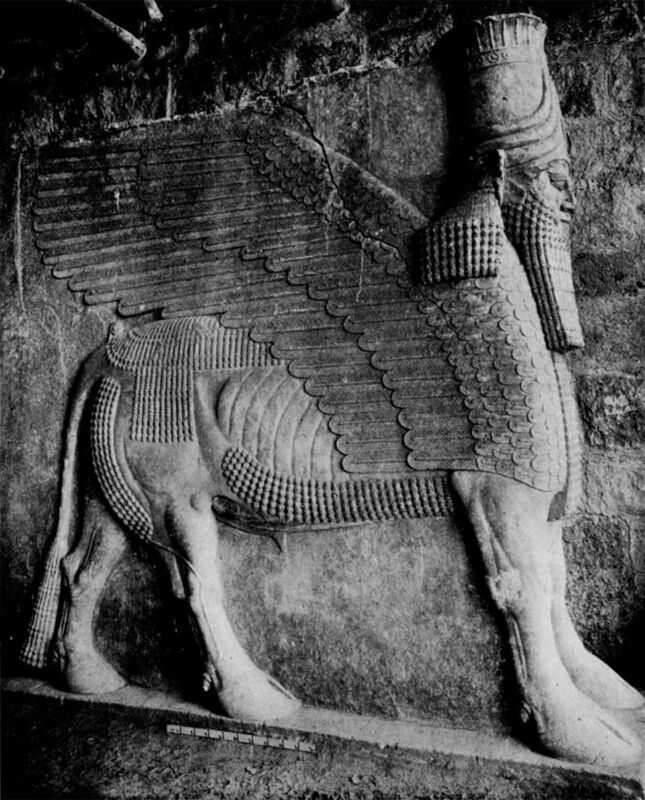 It stood at one of the many gates along Nineveh's city walls, as a protective spirit and a symbol of the power of the Assyrian king. "They're very intimidating. Those faces look quite daunting, the wings, the hooves, and the combined creature of many different animals that's very large and menacing-looking. It does strike you a little bit with fear which I suppose is part of the reason for these things," says Mark Altaweel, an Iraqi-American archaeologist. At the same time, amid its mass of curly hair and its tumbling beard, the Lamassu does have a kind of tight-lipped smile. It is stern, but in its own way welcoming. 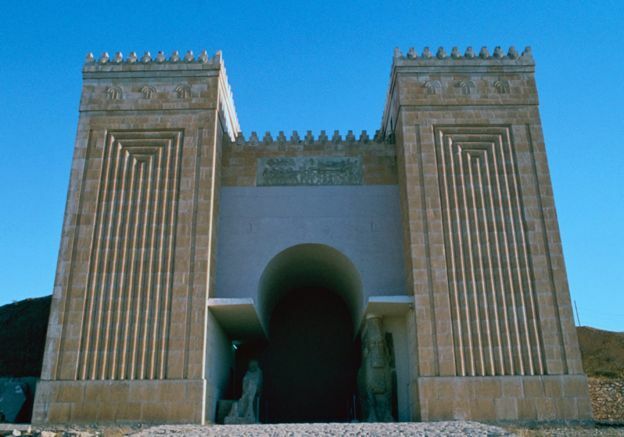 It was hewn from a single slab of limestone about 2,700 years ago, in the reign of the Assyrian King Sennacherib, ruler of an empire covering parts of modern Iraq, Syria, and Turkey. Nineveh, Sennacherib's capital "would have been the city of cities", says Altaweel. "The largest city anywhere on Earth, probably, by the time it reaches its peak in the 7th Century BC. All roads would have literally led to Nineveh." But a few generations after Sennacherib's death, Assyria was overrun. Nineveh was sacked and its palaces, walls and Lamassus slowly sank beneath the ground, eventually becoming a series of mounds of dust, sand and earth. 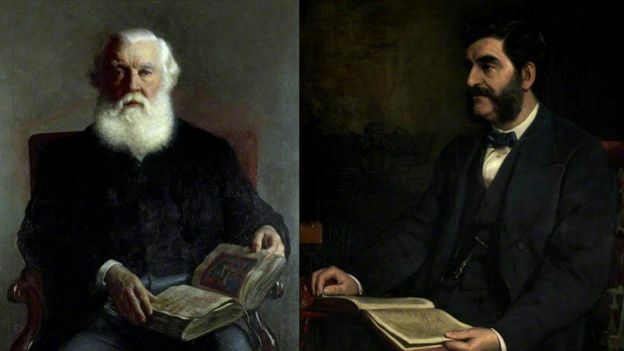 The name of Nineveh lived on partly thanks to its role in the Old Testament and the Koran, and in the 19th Century French and British explorers were inspired by Biblical texts to seek out the famed city. When the winged bulls emerged again from the dirt, the man who led the excavation, Sir Austen Henry Layard, was struck by their majesty and the exquisite craftsmanship. "Wide spreading wings rose above their backs, and their breasts and bodies were profusely adorned with curled hair," he wrote in 1853. "Behind them were colossal winged figures of the same height, bearing the pine cone and basket. Their faces were in full, and the relief was high and bold. More knowledge of art was shown in the outline of the limbs and in the delineation of the muscles than in any sculpture I have seen of this period. The naked leg and foot were designed with a spirit and truthfulness worthy of a Greek artist." Layard shipped Lamassus from Nineveh and other excavated Assyrian cities back to London, where some stand today in the British Museum. There are others in Paris, New York, Chicago and Baghdad. 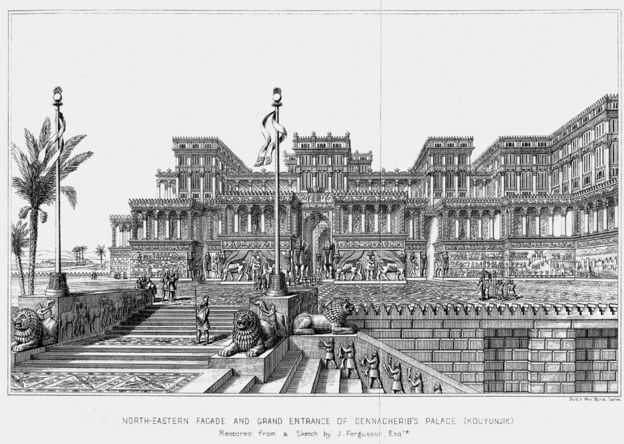 As modern Mosul developed and grew, the city began to encroach on Nineveh's archaeological sites and gobble them up. There's a story of an Iraqi archaeologist lying down in front of a bulldozer in a vain attempt to stop its advance. "Most of the site was essentially still [an archaeological] site but some of it was occupied by modern housing developments," says Mark Altaweel. "So I should say that the Iraqi government was relatively good, even during the Ba'ath regime in terms of trying to protect archaeological sites. They recognised that these things were important for national identity and for tourism and other kinds of benefits as well. "But particularly after 2003, law and order has broken down, frankly, in Iraq. Since then we're seeing people building on the site willy-nilly, without actually paying attention to the rules that were in place." But the greatest damage has been done in the last two years. When IS turned up, the skyline of Mosul changed forever with the detonation of shrines, minarets, mosques. And in time they turned their attention to Nineveh, and the winged bull, blasting away its face with a drill. 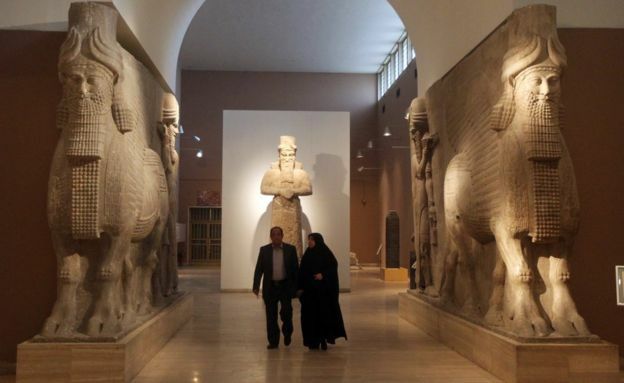 "Really I find it the most iconic of what ISIS destroyed, is going and boring the eyes of the Bull," says Lamia al-Gailani, a leading Iraqi archaeologist. "We have even a saying gulla abut ainak." An aggressive insult in the Arab world, it means something like, "I'm going to poke your eyes out." According to al-Gailani, this violent action can be traced back to the ancient world. When cities were sacked, marauding armies engaged in ritualised vandalism. This would involve smashing images of the king on the reliefs along palace walls. You hadn't fully toppled a king till you had also annihilated his images. 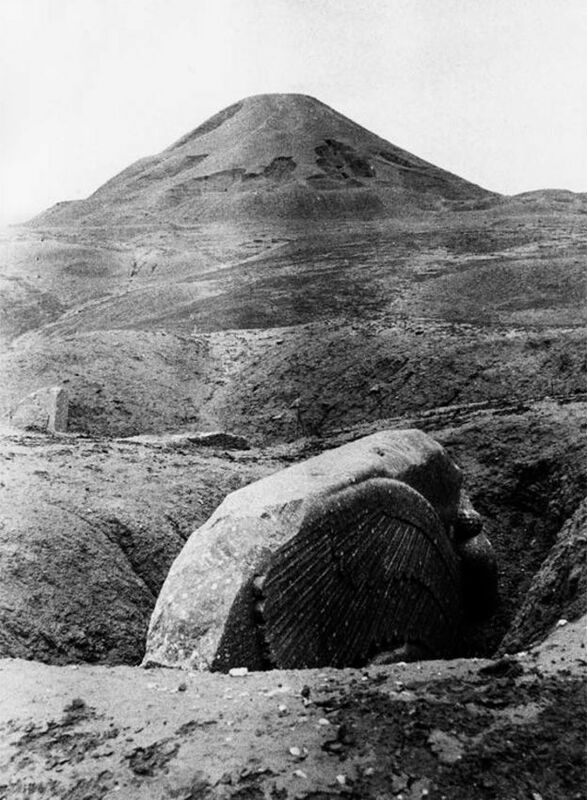 In Nineveh not only did IS gouge out the eyes of the Lamassu, they also blew up the shrine of the Prophet Jonah - Nabi Younis - who lived in Nineveh after his entanglement with the whale. There's a photo of Nabi Younis taken in the 1980s, and it shows a road, heavy with traffic, snaking between the tall piles of earth on the excavation site. It has always been difficult to separate everyday human life from the ancient monuments. This was also true 3,000 years ago. What Lamia al-Gailani remembers most fondly about the Lamassu wasn't its eyes or the ringlets of its beard, but something easy to miss. At the base of the statue, she found faint lines scratched by generations of ancient soldiers. These guards of the Assyrian empire, when they weren't off campaigning, had to keep themselves occupied on sentry duty, and entertained themselves with a game using a board they carved into the plinth of the august Lamassu. And according to al-Gailani, it looks like a game the people of Mosul still play today, called dana. It can be so easy to imagine these monuments as power frozen in stone. But in the case of the Lamassu, we remember its stony magnificence, but we also remember those Assyrian guards, who refused to be awed and carried on playing. When Hormuzd Rassam was growing up, Mosul was a peaceful place. The city was part of the slowly dying Ottoman Empire, a provincial backwater that offered few prospects for a young man of energy and talent. But in 1845, when Rassam was 19 years old, he met someone who changed the trajectory of his life - Austen Henry Layard. Layard was an adventurer who had arrived in the Middle East on horseback at the end of the 1830s, armed with plenty of cash and a pair of revolvers. He was captivated by the ruins of Iraq. The Museum of Lost Objects traces the stories of 10 antiquities or ancient sites that have been destroyed or looted in Iraq and Syria. 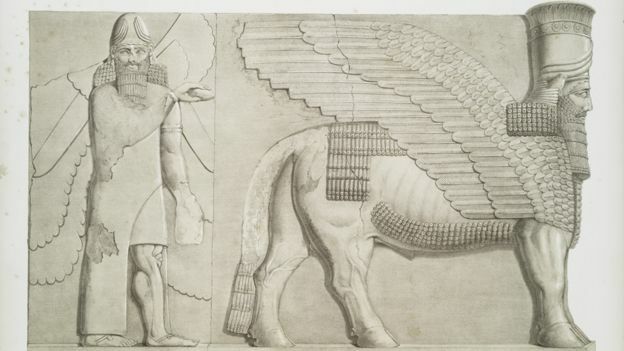 Listen to the episode about the Winged Bull of Nineveh on Radio 4 from 12:00 GMT on Monday 29 February orget the Museum of Lost Objects podcast.